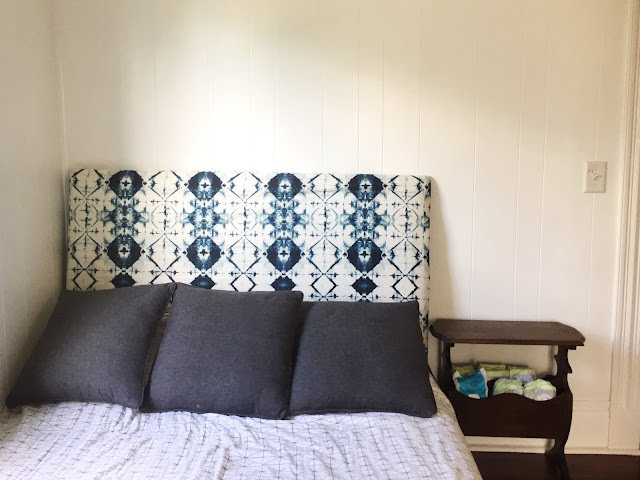 This project intimidated me a little bit because of the size of the headboard and the cost of the materials, but it ended up being a lot less daunting when I actually was in the midst of this DIY. I was pleasantly surprised at how much easier upholstering my own headboard was than I thought it would be. This took me probably 3-5 hours to make a queen and two twin sized headboards while watching two kids and taking lunch and water breaks. 1. Cut the plywood to size. I taped off the headboard size on the bedroom wall to make sure it was the size I wanted. I measured the taped off area and got it cut at the store. The queen is about 5'x3'. I used some of the extra pieces of that plywood for the twin headboards. 3. Lay out the batting over top of the egg carton. I added a couple of extra layers of batting around the edge so it was a little more padded. On the twin beds I was able to wrap the egg carton around it and that would be my preference on my next piece. 4. Staple a couple of times on each side to make sure it's secure and then staple every inch or so all the way around to make sure it's really taught and secure. 5. Lay the fabric down on the ground and put the headboard on top. Staple a couple of pieces on each side and check the front to make sure it's wrinkle free before going back around and stapling ever half inch or more. If you chose your final fabric to use on the last step, then you're all ready to hang. I like to make life a little complicated sometimes, so I wanted to make a slipcover for this. I have messy kids and we sometimes like to have dinner and movies in bed. I knew that making a slipcover would make my life easier in the long run. I originally was thinking of doing something that was kind of like a fitted sheet, but finally came up with this little idea. 6. Put fabric wrong side out on the headboard and pin at the corners and mark where you're going to sew. 7. Sew the corner. I have no official training and not exactly sure how other people would do this. I just folded and sewed in a straight line. It looks great so winging it is okay. 8. Sew the velcro strips in various spots around the bottom three sides of the fabric. On the queen, I put a velcro in the middle section, but it isn't really necessary. 9. Attach the remaining velcro strips to the plywood and voila, you're finished with the slip cover. 11. Hang using french cleat.